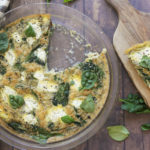 This Spinach, Mushroom, and Goat Cheese Quiche is the perfect dish to enjoy for breakfast or brunch. So simple to make yet jam packed with an impressive list of nutritious ingredients that are sure to keep your ketosis heart happy. This fluffy concoction works well as either a main entree or a side dish for your epic morning feast. Besides being extremely tasty, this dish seamlessly integrates nourishing ingredients and provides a delightful way to start your day. Can’t finish it all? Don’t worry, this quiche keeps perfectly for leftovers to enjoy throughout the week. Each of these ingredients contributes just the right amount of nutrition to keep up with your keto requirements. Eggs have a complete amino acid profile and are one of the most abundant sources of protein. Not only a great source of protein, they also keep your heart healthy they contain lutein and zeaxanthin[*]. Spinach contains carotenoids, which have been shown to reduce inflammation, decreasing the chances of cardiovascular disease [*]. Ever wonder why you’re supposed to crush garlic before incorporating it into your dish? The answer lies with Allicin. Allicin is an enzyme that’s released when raw garlic is crushed. This enzyme has been linked to reducing the risk of several illnesses, including heart disease[*]. The antioxidant, anti viral and and anti inflammatory properties in Mushrooms help fight free radicals and diseases which boosts immunity. Spinach contains a plethora of antioxidants, like vitamin A (beta carotene) and C, which protects the body against harmful bacteria and toxins[*][*]. Mushrooms contain phosphate, potassium and selenium, which are great for lowering inflammation. They also contain a powerful antioxidant called ergothioneine, which studies have shown to lower inflammation when consumed[*][*]. Since spinach contains vitamins A (beta carotene) and K, and folate, it has extremely powerful anti inflammatory properties and is one of the most nutrient dense plants available[*]. The lutein in eggs helps regulate high density lipoproteins (HDLs, aka good cholesterol) and low density lipoproteins (LDLs, aka bad cholesterol). By doing this, it lowers inflammation in the bloodstream and reduces the risk for heart disease[*]. Now that you’ve heard all about this tantalizing dish, let’s get to cooking! Preheat the oven to 350ºF. Squeeze the excess water from the thawed spinach, set aside. In a medium bowl or blender, whisk together the eggs, milk, thyme, 1/4 teaspoon of salt, and a pinch of pepper. Set aside. Add 1 tablespoon of olive oil to a large pan and set to low heat. Add the mushrooms, garlic, and 1/4 teaspoon of salt and a pinch of pepper. Sauté the until the mushrooms are soft, add water as needed if pan begins to burn (about 5 to 7 minutes). Coat a 9 inch pie dish with non stick spray. Place the spinach and mushrooms in the bottom of the pie dish. Pour the egg mixture over the vegetables. Top with small pieces of herbed cherve. Bake for 20 to 22 minutes or until the top is golden brown (ovens may vary). Cut into six slices and serve.